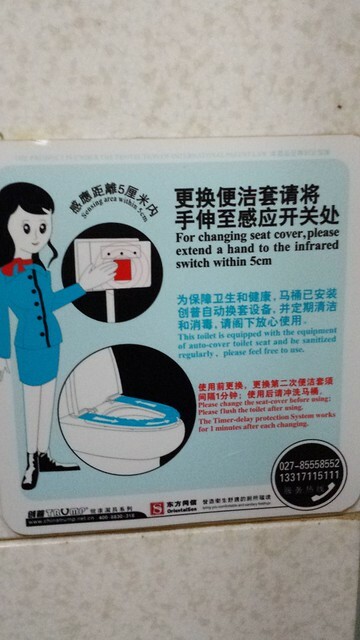 I took flight from WuHan to BeiJing on 30th Jan. 2015, and the toilet seat lid in the airport interest me, it is designed to replace the cover of the toilet seats automatically, just wave your hands before the sensor, the seat cover is plastic and move in circle to let the unused part to cover the toilet seat, and the used parts to be collected back. As we always have concern about the sanitary issue in the toilet seat, sometimes the toilets seat is too dirty to sit on it, and prefer the toilets with sinking hole to squat down, this design solved the problem. Another time I saw similar idea in the Singapore airline airplane toilet, to use the one-time paper cover to cover the seats, but not as good as this one.